What is the state of contemporary art today? Lord only knows. Things are so teeth-gnashingly topsy-turvy out there that only an amphetamine-fueled fool would dare propose an answer. But if you’re looking for trends, one seems undeniable: Artists today love displaying ephemeral materials on a grandiose scale. Ephemeral might mean dead and decaying (think Damien Hirst’s shark); it might mean industrial or consumer refuse (think Tara Donovan’s Styrofoam cups and plastic drinking straws); or it might mean ambient concoctions of sound, steam, and light (think Krzysztof Wodiczko, Olafur Eliasson, Martin Creed, or James Turrell). In every case, the results take up space. Lots of it. A brisk attempt to account for the phenomenon might point out that the humble materials bespeak a desire to undermine clichéd expectations of preciousness in art, while the grandiose scale betrays art’s envy of the culture’s more spectacular entertainments. But two new contemporary shows at the Massachusetts Museum of Contemporary Art and one at the nearby Sterling and Francine Clark Art Institute suggested to me an alternative reading: an attempt to reconnect art with the enchantments and marvels of childhood. Confusions of scale, as Lewis Carroll knew, are central to every child’s experience of the world. And all materials can seem ephemeral and full of transformative potential to minds not yet schooled in the difference between worthlessness and worth. Mass MoCA, the most consistently stimulating museum devoted to contemporary art in New England, has space to burn, making it the ideal place to show this kind of work. “Material World: Sculpture to Environment,’’ a group show devoted to large-scale, environment-altering installations made from cheap and plentiful materials, sees the museum playing to its strengths. One installation, by Tobias Putrih, stretches long strands of fishing line across a dark and cavernous gallery. Bunched neatly together, the parallel lines start high on one wall, ending low on the opposite one. A single light source illuminates the strands at about the midway point, causing an optical effect reminiscent of spinning rotor blades or a mystical halo. You can follow the path of the stretched filaments, which slowly descend below head height to waist level, in a tunnel-like space the dimensions of which become harder to perceive as you move away from the light. Putrih was inspired, we learn from a brochure accompanying the exhibition, by the Hoosac Tunnel, a fabled feat of engineering just east of North Adams. His exquisite work re-creates the thrill of tunnels while magically dissolving the claustrophobia. Rather less evanescent is an installation in the next gallery called “Big Boss.’’ Industrial-strength ropes of different thicknesses painted bright red cover the surface of one wall in snug, horizontal rows before appearing to smash through a perpendicular wall, spilling out in muscular heaps across the neighboring gallery’s floor. The creation of New York’s Orly Genger, it’s a work to marvel at rather than think about. My kids, 3 and 5, who accompanied me on a second visit to the show several hours after I viewed it alone, were spellbound. “How did that happen?’’ they wondered, staring at the hole in the wall. They were even more taken with a nearby installation by Maine artist Wade Kavanaugh and Minnesota’s Stephen B. Nguyen. These collaborators describe their work as “investigations of the uncertain territory between imagined and physical space.’’ The first sight of “White Stag,’’ the title of their piece here, comes in a gallery with a low ceiling from which hang gnarly roots made from twisted and crumpled paper. Take the staircase to the floor above, and these fantastical shapes, now resembling the trunks and branches of an old-growth forest, spread across the room, up the walls, and through cavities in the ceiling. When all this became too much, we wandered on through impressive installations by Alyson Shotz (steel wire, silvered glass beads, and plastic magnifying lenses), Dan Steinhilber (a room draped in white plastic sheeting, like a giant lung), Michael Beutler (timber coated in tinfoil), and Eli Levenstein (bubble wrap, Astroturf, goose down, extension cords, etc.). Coyne’s sculptures are loaded with poetic allusions (the show’s title is borrowed from a short story by Flannery O’Connor). But unlike the work of so many of her peers, they do not rely on outside emissaries of meaning: They generate a poetry that’s all their own. Coyne layers materials the way some artists trowel on paint. The first works one sees (also the most recent) are densely compacted but artfully arranged accumulations of wax and silk flowers, satin ribbons, black sand, flowing velvet, and taxidermy. “Untitled #1336 (Scalapino Nu Shu),’’ the most arresting of them, is an apple tree coated in black sand. Its branches are weighed down by stuffed peacocks perched upright and pheasants hanging upside down. The work is a complex homage to O’Connor, who loved peacocks and equated them with renewal and with the Catholic Church; to the artist’s friend, the poet Leslie Scalapino; and to Nu Shu, an old Chinese writing technique used solely by women to express fear and loneliness. But the visual and sculptural richness of the piece is so overwhelming that trying to process such allusions is like trying to eat salad after a dessert of dense chocolate cake. It can’t hurt, but it’s sort of too late. With the exception of her blurry, black-and-white photographs (look out for an extraordinary image of a crowd of Japanese monks running through a forest), all of Coyne’s work is a bit like this: It can feel like too much. But I admired the fearlessness of her aesthetic, which is the absolute antithesis of minimalist cool. Ten minutes away, at the Clark, the late Spanish artist Juan Muñoz is the subject of that museum’s first display of contemporary art since 1977. Muñoz, who died unexpectedly at the height of his fame in 2001, age 48, used figurative sculptures — often people with Asian facial features — to animate gallery spaces in perception-altering ways. He played with illusions both of vast scale and intimate voyeurism. The bulk of the show can be found in the rather severe modernist spaces of the Tadao Ando-designed Stone Hill Center up the hill. 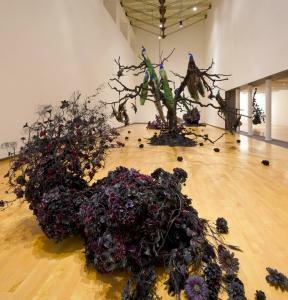 But the Clark’s stately permanent-collection galleries have also been “interrupted’’ by several Muñoz installations. One, in the central gallery groaning with Renoirs and Monets, is a gray figure hanging by his teeth from a rope attached to the ceiling. The work alludes to “Miss La La at the Cirque Fernando,’’ a painting by Degas of a circus performer engaged in a similar feat. There is also an intriguing arrangement of seated figures holding drums in various positions, a cast-iron balcony installed high on a wall, and a flick knife concealed behind a wooden banister. Up the hill, one gallery is filled with a crowd of dozens of laughing gray figures wearing coats, and another with the jackknifed carriages of a derailed high-speed train, its interior transformed into a desolate city square. There are several more sculptures displayed on outside terraces. Although I’m predisposed to like Muñoz, whose work exudes intelligence and wit and is haunted by quizzical silences, I feel this show falls short. Inevitably, one enjoys the spirit of Muñoz’s respectful yet mischievous dialogues with the art of the past, and his acerbic meditations on politics and society. But beneath all this, his pieces remain obscure and hard to parse. If the Clark is to get serious about contemporary art, I think it needs to present difficult work like this with more tact and clarity. The wall labels are vague and clumsy, and the catalog essay is a rambling, free-associative indulgence that is entirely unhelpful. That said, I applaud the Clark for mounting the show, and can recommend it sincerely. Muñoz was one of the most intriguing artists of his generation. He had an immensely subtle understanding of the inherent theater of social life, and beguiling ways of communicating it.